I have literally fallen in love with every single cat that has crossed my path since I was a little girl. They have been my "calling" for over 35 years. I have all kinds of foster kitten stories, stemming all the way back to my own childhood (thanks mom!) Now that my husband and I have three crazy-cat-loving sons of our own, the kitten fostering stories have continued. Over the past few years, my heart kept getting pulled to help on a grander scale... I would daydream, save pinterest boards, and talk a big-game... but one day it clicked, the time was NOW... so we pushed past fear and moved forward. 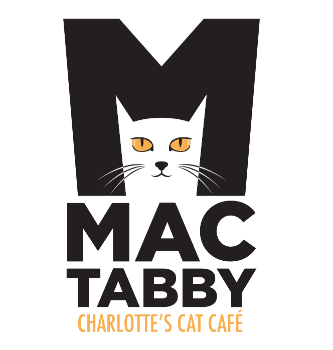 We opened Mac Tabby in 2017 and are now witnessing the impact our community makes on the lives of homeless cats! We have met so many amazing people since our doors have opened, and we are so thankful that you're along with us for the ride! My husband, Nick, and I adopted OUR first kitten together from the ASPCA in 2001. He was our first "baby" together and he sadly passed over 'rainbow bridge' last year. Kitty was along for a 16 year ride... we were married, moved 5 times, had three children, we did a lot... he was there through it all! To honor the memory of our awesome 'Mackerel Tabby' cat, Nick came up with name "Mac Tabby" and I couldn't love it more. Mackerel Tabby cats have striped rings around their tail and legs, a "necklace" of stripes on the front of their chests, and bands of solid or broken stripes running down the sides of their bodies. He was such a cool cat! There are literally no words to express my gratitude and "thank you" will never be enough. Mac Tabby has been created out of positive energy and love, something we know that each cat that comes through our doors will continue to feel. It's the foundation that their foster café was built upon!